The idea for this project came from vintage Miniature Kitchen toys, sometimes called Nuremberg Kitchens and were available in the early 1800's and later. 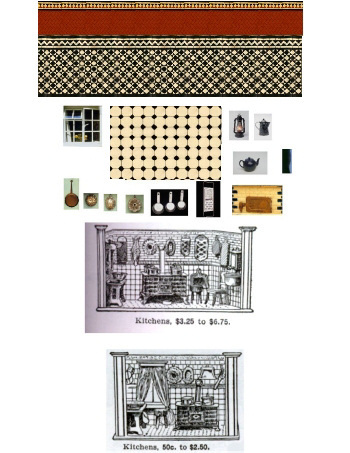 These drawings are from a John Wanamaker 1905 Catalogue. 4 1/2" x 3 1/2". Glue the room and floor to card stock or crescent board then fold the room into three. Add the window using card for trim. The stove can be glued to a small piece of wood or layers of mat, then add a black top to the stove and the pipe and glue to the back wall. The accessories can be cut out, shaped and glued to the walls. Add furniture of your choice, a butcher block and table made of wood or card. A cutting board and rolling pin could also hang on the walls. Then let your miniature child play to her or his heart's content. Hope you enjoy this project. I would like to thank my friend Shirley Rose for lending me her brochure with turn of the century tiles and bricks. I also used these tiles and floor for a 50's Kitchen using styrene plastic pieces for the cupboards, I changed the colour of the tiles in a print program and laminated the tiles. The painted metal minis are from Anitamoriginals. 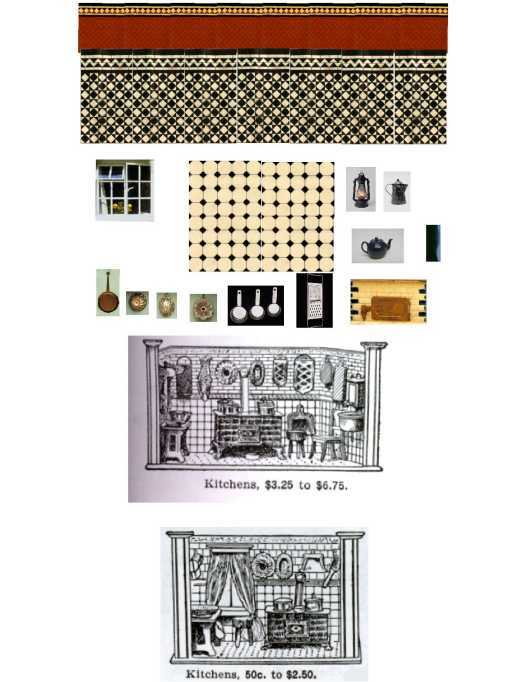 Helen from York sent a message to Small Stuff with a wonderful description of her Nuremberg Kitchen ( click on the link to read).